Even though this therapy is quite expensive, it can help people with neurological problems, autism and Down’s syndrome. This therapy has the approval of the Masters of Light since it has positive effects on people with this kind of problems, but just like any other therapy it only alleviates the symptoms and does not heal completely the condition, therefore it’s important not to expect dramatic results. I’d like to ask you about an autistic child who is the grandson of a friend of mine in Cuba, he is 12 years old and has no improvement in his condition, I agree with you in the topic related to karma, but I read that It’s possible that this kid could improve if he listens to classical music. Now the kid has become aggressive and his parents need any kind of help available. Sincerely Marjorie S.
Ruanel: He has a genetic engramic problem, but from a past life. Interlocutor: Not in his present life? Ruanel: No, not at all. It is a dysfunction that has to do with a karmic lesson and it is also engramic. Interlocutor: Can he reverse his condition? Ruanel: Practically not, although he can find relief if he is treated by neurologists. It also depends on the economic position that his family have, because he can be treated with zootherapy. Interlocutor: Do you mean dolphin therapy? Ruanel: Correct. Dolphin therapy, something that unfortunately exists only in few countries, this kind of therapy is very useful in this type of illnesses. Interlocutor: In the United States, for example? Ruanel: No, rather in some European countries and also South American countries like Chile. 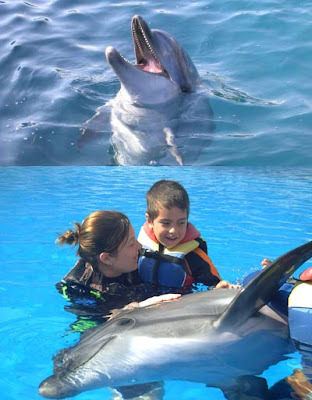 Interlocutor: How can a dolphin help this boy? Ruanel: This animal emits a sound that somehow helps correcting DNA chains and improves the mental decoder of an autistic boy. Interlocutor: I read somewhere that a recording of the sound of the dolphin also helps. Is it correct? Ruanel: Yes, it can help. Besides, there are many conditions that can be alleviated just by touching the animal without being autistic. Interlocutor: What kind of problems are you referring to? Ruanel: There are neuronal problems that prevent locomotion and those who have this kind of problem walk with difficulty. In other cases there are expression dysfunctions. Interacting with dolphins alleviates the symptoms, because that attitude awakes a beneficial emotivity ad that makes the energy in the chakras circulate more fluently and this can heal part of the body and the mind. Interlocutor: In order for this to happen, he would have to be introduced in the aquarium where the dolphins are. Interlocutor: Do you ratify me what you said before that the recording of the sound of a dolphin can help? Ruanel: Yes, it is important and it can help him a lot. Interlocutor: Is the human hearing capable to listen to all the sounds of the dolphin? Ruanel: The answer is no, because the dolphin emits ultrasounds that cannot be heard by the human hearing. Interlocutor: but the recording captures the sound? Ruanel: Of course, the recording captures it! And certain part of the hearing also captures it and the same thing the healthy emotional part of the human being. Interlocutor: Concretely, then, can I suggest to this person that she gets this kind of recording? This entry was posted at Thursday, November 26, 2009 and is filed under Therapies . You can follow any responses to this entry through the .